I rather liked The Bourne Legacy, though it is certainly formulaic and silly in parts, but Jeremy Renner is amazing. He's not the most ripped or handsome action hero out there (most of them are comically ripped and/or handsome), but there's something about his acting that is very emotionally appealing. I also have a soft spot for parkour stunts and Moby. The movie raises some philosphical questions about the morality tweaking human chemistry, for what purpose, and how much do we know…which is the main reason I write this blog. I like to look through the evidence for low-risk, common sense prevention and symptom help for mental health conditions. Going down into the labyrinth of medications for mental health can get very complicated and beyond a lot of evidence base too fast for comfort. The vast majority of the people I see for an intake have already started medications. I'd like to be able to reach some people before that point, when it is reasonable to try a better sleep plan, better food, exercise, and stress reduction. First off a new post at Psychology Today about a study released last week linking consumption of coffee (with or without grassfed butter, I imagine) to lower rates of suicide. Hardly evolutionary, but certainly low risk, unless you have bad insomnia or anxiety. A powerful tool to change our biochemistry is to eat good, whole, natural, unprocessed food. Those definitions get muddled enough to be frustrating…but I really mean industrial processing, not the processing of fermentation or sprouting or rinsing, etc. Here are two new cookbooks out to give you some more ideas about how to incorporate convenience into a whole foods diet. Both these books were sent to me free of charge by the publishers for review. First up is Paleo Lunches (and Breakfasts) On the Go by Diana Rodgers, who is a practicing nutritionist and farmer in the process of getting her RD. She hosted the amazing farm to table dinner at AHS12 that I'm rather sorry to have missed (already had plans…). 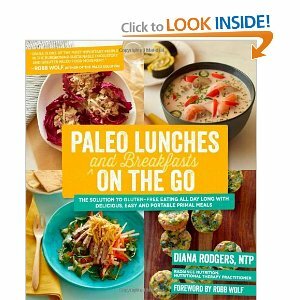 Diana's book is (as advertised) filled with plenty of quick and easy options for lunches and breakfasts. I still admit to eating two poached eggs every single morning, though maybe once a month I change it up with some gluten-free pancakes or a smoothie. Today I made some egg muffins (basically an omelet in a muffin tin), based on a recipe from the book and they were delicious, and the kids ate them with very few threats, even though I added green peppers. As a working mom, Diana has some of the same time constraints I do. I need fuss-free food that will keep, be easily packed for camp or school, and I don't have time to make special, different meals for the kids. Her recipes (so far) are flavorful, easy, but interesting. I have a special talent for taking great ingredients, throwing them together, and making horrible food (particularly in the crock pot), so cookbooks like this one are essential reading in my house. Diana also told me, "I hate baking," and there is a minimum of mixing and baking in this book, fortunately. Second up is a book sent to me by Primal Blueprint publishing, Primal Cravings, Your Favorite Foods Made Paleo. I got it in the mail at a particularly busy time and didn't have a moment to review it until now. 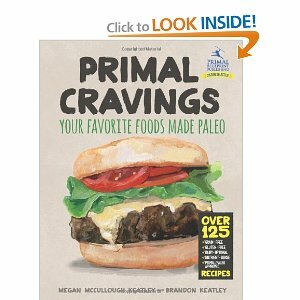 I do like Primal Cravings, and it does have a place on the shelf now growing heavy with paleo cookbooks. Just remember my bias is for easy recipes with not too many ingredients because I can't be too fancy or fussy even for a family get-together (my family usually gets a roast or roasted chicken for those sorts of occasions). In a couple of weeks I will be giving a talk on disordered eating in the modern world at AHS13 in Atlanta. They rented out a much bigger venue this time, so I believe there are still tickets available. Looking forward to seeing my paleo buddies again! I'm working to make my talk both interesting, evidenced-based and practical so we'll see. Be sure to say hi if I'll see you there. Is your talk available as webinar or some other format for people that cannot make it to your presentation in Atlanta? Thank you! Just because we avoid gluten, doesn't mean we aren't causing damage with the substitutes. Anything that raises blood sugar and induces insulin can cause inflammation, damages blood vessels (Alzheimer's, PVD, ED), oxidize LDLs, increases growth of carcinomas, and is stored as adipose tissue unless you're physically active right after you eat it.